World number one Serena Williams says she is using the soaring temperatures at the Hopman Cup in Perth to prepare for the Australian Open. Williams will join forces with John Isner as the US take on Italy on day one of the mixed team event on Monday. Andy Murray and Heather Watson will represent Britain, with France their first opponents. 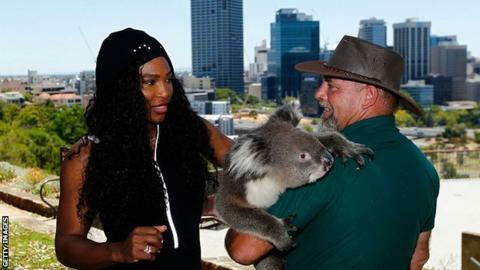 "If anything it's going to help me for Melbourne," Williams said of the predicted 40C temperature on Monday. "Perth is one of the hottest places I've ever played, so it will be really good for the preparation in Melbourne, which is always super hot." The Perth Arena roof will be shut when Williams takes on Italian Flavia Pennetta if the heat policy is enforced, or both players agree the conditions are unsafe. Williams, 33, has won the Australian Open five times but not since 2010, and she will be targeting a 19th Grand Slam title when the tournament gets under way on 19 January. The temperature touched 41C in Melbourne in 2014 and this year. "I haven't won in Australia for several years, but there's also a lot of other people who want to," added Williams. "I'll just have to do my best." World number seven Eugenie Bouchard, representing Canada, suffered an early defeat as she lost 6-0 6-4 to Lucie Safarova of the Czech Republic on day one of the Hopman Cup. Poland's Agnieszka Radwanska, the world number six, made a solid start as she defeated Casey Dellacqua of Australia 6-2 6-3. The 2015 season begins in earnest next week with Roger Federer and Maria Sharapova headlining the men's and women's draws in Brisbane, while Novak Djokovic and Rafael Nadal line up at the Qatar Open in Doha. Djokovic pulled out of an exhibition final against Andy Murray in Abu Dhabi on Saturday, and the world number one will test his fitness levels with a doubles match alongside young compatriot Filip Krajinovic on Monday.